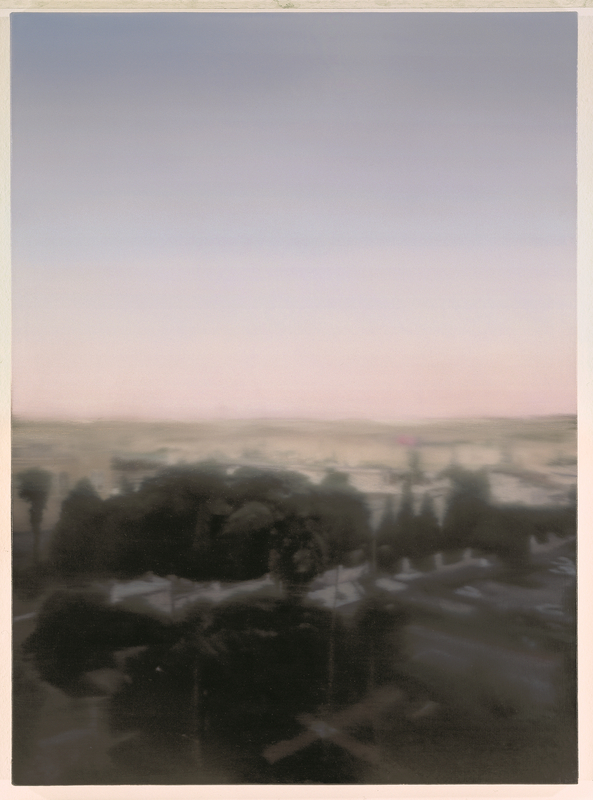 In this ethereal painting of the city, the German artist Gerhard Richter recreates a snapshot photograph he took of Jerusalem from his hotel room in 1995, looking towards the Christian Quarter. Discernible features of the cityscape have been all but erased in the painting, partially anonymising the city, or supplying it with a sense of timelessness. Only with very close inspection is it possible to make out a lamppost or car amongst the architectural structures. By these means Richter’s rendering of Jerusalem appears simultaneously as a vision of the city from centuries ago and a bird’s eye view on the contemporary metropolis. While the image is not a work of imagination, the ambivalent and luminescent light imbuing the painting effects a dreamlike quality in the image, perhaps alluding to the mystical and mythical status of the Holy City. Unlike some modern artists who chose to focus on the desolate quality of contemporary Jerusalem, or explore the religious and national divisions in the city, Richter’s work seems to meditate on the impossibility of visually conveying the full complicated history of the place. Instead his painting functions like a medieval visual aid for spiritual pilgrimage, evoking in its viewers a personal, individual response to the site by encouraging the exploration of their own memories and imaginings of the city, brought to the fore by his own ambivalent representation.